Shipping containers offer the oil and gas industry a superior solution for modular control rooms and sheltering the remote terminal units (RTUs). Skid-mounted instrument buildings can easily cost over $20,000, but minimalist shelters without walls just don’t offer enough protection against weather. 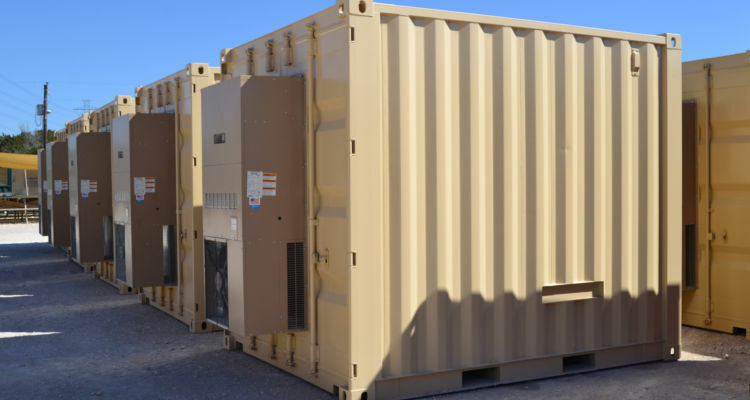 Modified shipping container RTU enclosures cost thousands of dollars less than skid-mounted buildings, deploy in weeks instead of months, and lower maintenance expenses—all while offering superior protection. Containerized RTU units and controls rooms met or exceeded key criteria. Water-tightness. Special modifications ensure a shipping container enclosure won’t leak, even when hosed down. Units are also rodent-resistant. Conduit ports. Innovative designs in our bulkheads removes guesswork during fabrication and prevents installation delays caused by fluctuating measurements. Climate control. Falcon Structures installs industrial grade HVAC systems in steel-framed openings. We also insulate enclosures to your specs. Electrical power and lighting. Modified shipping container units are plug and play. Lighting and wiring come pre-installed. Roof loads: Our shipping container RTU enclosures have stood through two snowy winters. Special roof reinforcements ensure enclosure roofs maintain structural integrity in even the snowiest winters. Wind resistance. Shipping container walls easily resist wind loads in excess of 100 mph. Floor loads. Shipping container floors are rated to handle 299 lb per square-foot. Security. Corten steel walls and heavy-duty personnel doors prevent malicious tampering. Why switch from skid-mounted instrument buildings and control rooms to container enclosures? Energy Transfer had previously used steel skid-mounted instrument buildings to protect their remote terminal units (RTUs). 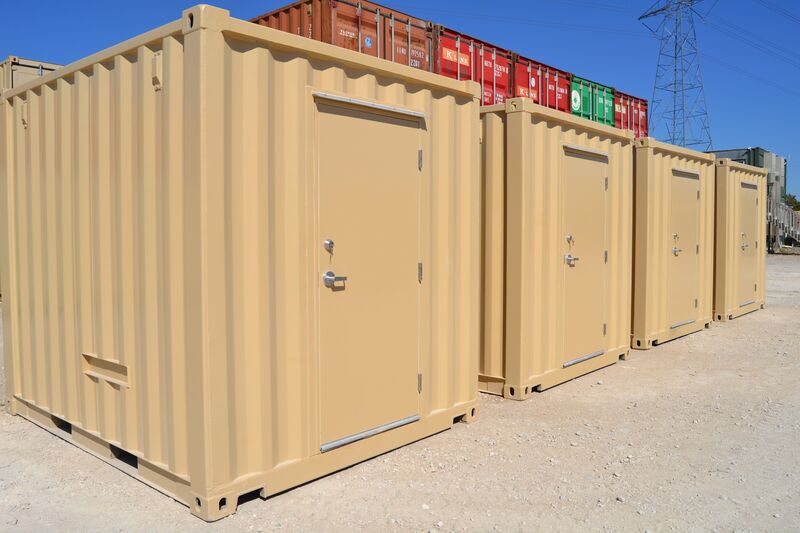 While skid-mounted buildings were effective, shipping container enclosures offered the same or better functionality at a lower cost with faster deployment. Cost: In addition to a lower upfront cost, superior equipment protection lowers maintenance costs. Speed of deployment: Falcon Structures can deliver a completed RTU enclosure just six weeks after the initial order. Our speed increases with order size. 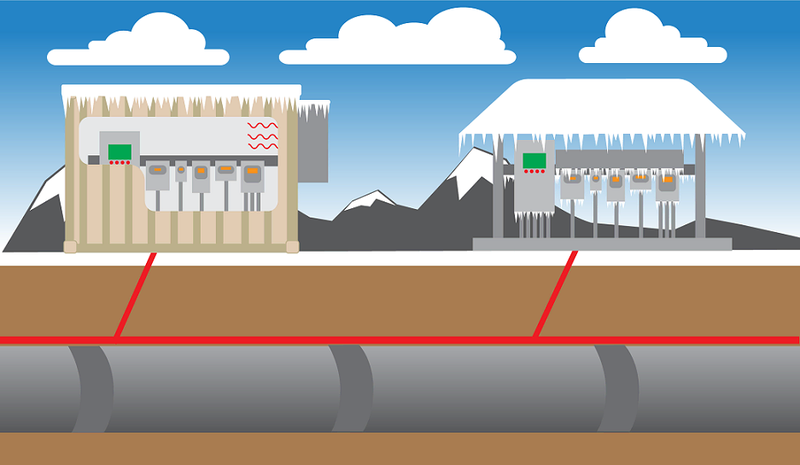 We delivered ten units in just eight weeks when Energy Transfer ordered in bulk. Modularity: Energy Transfer keeps spare shipping container RTU enclosures on stand-by should they need a fast replacement. Skipping the skid. Shipping containers come with built-in forklift pockets for easy relocation. 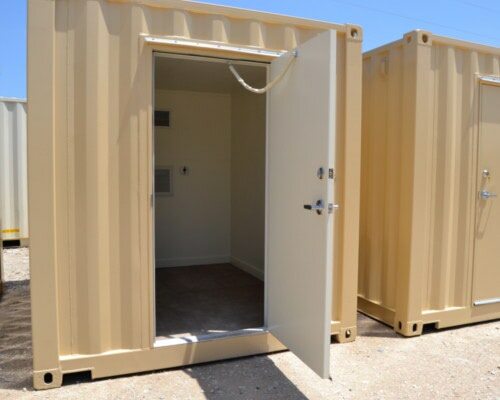 When conditions permit, containers can be placed directly on the ground without a concrete pad. If you'd like to learn more, you can download our guide, "7 Reasons the Oil and Gas Industry Uses Steel Modified Containers." Have questions? Contact us at 877-704-0177 or sales@falconstructures.com.